Are we equally represented ? We the people have always been trying to form a more perfect union. that comes with equal representation, equal voice. 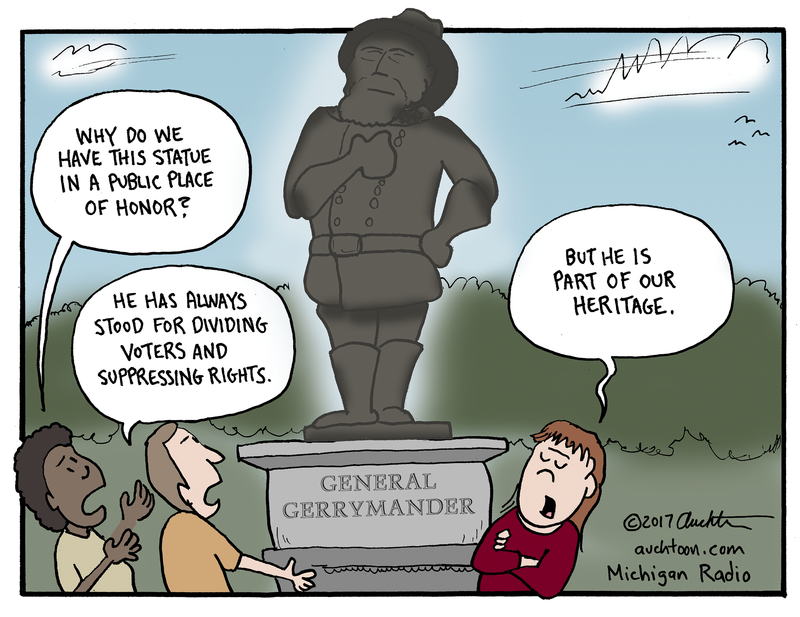 This cartoon speaks about a practice known as “gerrymandering” when the party in power during the 10 year census draws district boundaries that disproportionately represent some groups while dividing others. We are still working to bring equal voice to the voters of Virginia. Virginia is divided into eleven boundaries and in those eleven boundaries we have different people representing us, we have seven republicans and four democrats, representing Fairfax county they have Gerry Connolly as well as Barbara Comstock. Virginia is a gerrymandered state, both on the congressional and state levels, based on lack of compactness and continuity of its districts. We are not equally represented in Virginia the districts are not equally divided . We need a neutral “third party” to make more equitable boundaries of representation. Census =an official count or survey of a population, typically recording various details of individuals. The Constitution requires a national census every 10 years. Gerrymandering = is a political leverage to give disproportionate advantage for a political party or group manipulating district boundaries. The state of Virginia is currently having a debate about “gerrymandered” districts. Equity = the quality of being fair and impartial. equal representation. Voting District = the boundaries that define a number of constituents who all go to the same polling place. Jurisdiction =the official power to make legal decisions and judgments. Constituent =being a part of a whole. Delegate =a person sent or authorized to represent others, in particular an elected representative sent to a conference. Representative=a person chosen or appointed to act or speak for another or others, in particular.